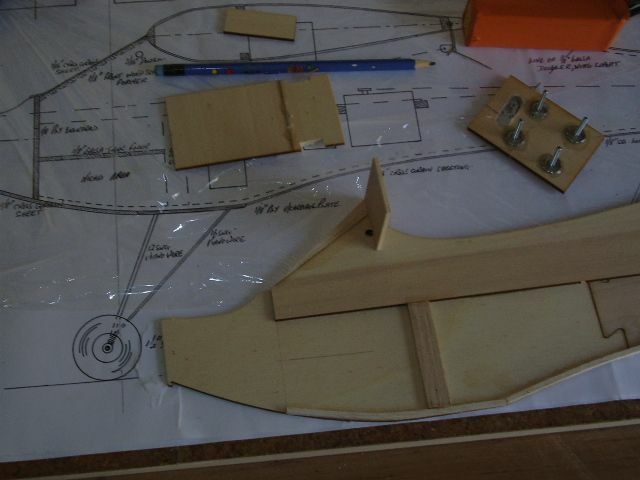 I'm starting with the fuselage, no fundemental reason, but I always start there! The fuse halves have been glued together and the doublers have been added, making sure of course I made a left and a right (hands up anyone who hasn't made that mistake at least once!) and here I an adding the longerons. My building board, in case your interested, is a piece of Melamine sheet faced with a double layer of cork tiles. I've had this for a while now and it works well, straight, stable and takes pins well. I use aliphatic, so I have to wait while everything dries properly now! Doesn't look to bad eh? But to get that space these fellas (who normally live in there as well) have to be moved onto the landing! This does not make me popular with those who want access to the bathroom! I'm hoping to move into the garage later in the year when I'll have a lot more space - Mrs BEB has given consent, presumably she is fed up stepping over and around models in order to visit the loo! 1 articles Go for it BEB, when's the test flight? 1 articles Wouldn't that be the BEB Cam? Mmmm, as this is likely to be of the "stick one piece in place each day and eventually you'll have a model" sort of build I suspect a webcam would be a bit boring! I don't plan to do this as a blow by blow account as the lead builders, and others like you guys, have already done that brilliantly! So just occassional updates as when it seems relavant. Hope you enjoy the build as much as I did BEB, is that a Chipmunk I spy. Sure is Chris. Lovely flier with an OS91FS upfront. 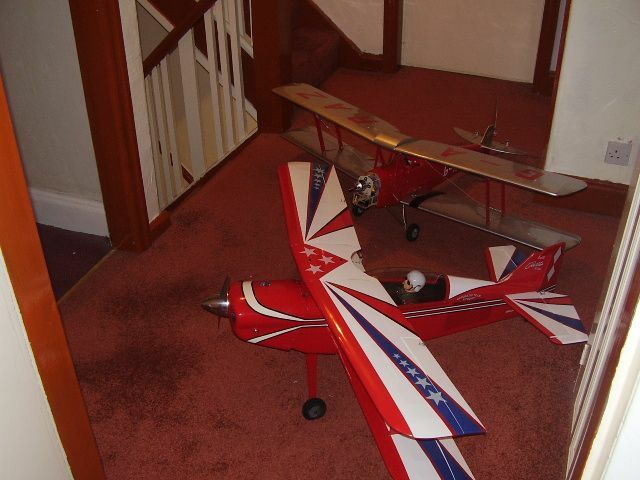 That is one model aircraft I would really love to fly. I have some full size hours in one from some years ago. Hi Chris, yes me too - happy days in the ATC and all that! It is a lovely model to fly. You can just potter round very scale like, or if the urge takes you its quite good at aerobatics for a scale model. Anyway, back to the WebBit. I wanted to go flying today, but the wind was just too gusty. So, after tripping down to the field and have a chat (but no flying! ), I came back to play WebBits. Fair bit done today, but not a lot to show for it . 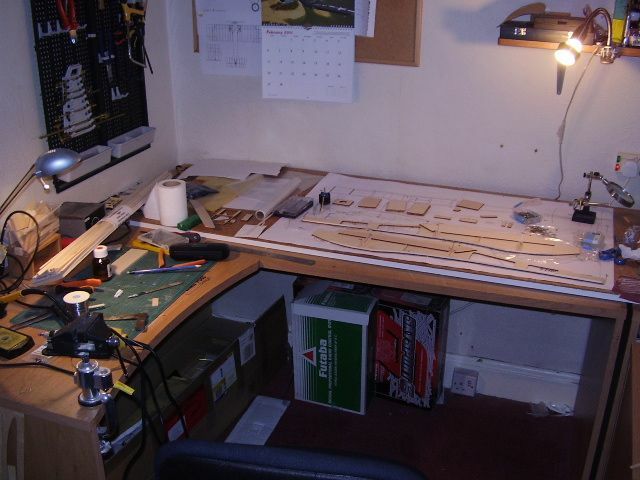 All the preparatory work ready to assemble the fuselage. Personally I dislike wing bands, so now we have the first modification to Steve's design. I've added a wedge of 1/8th balsa to the windscreen profile so as to extend it above the centre line of the wing profile. 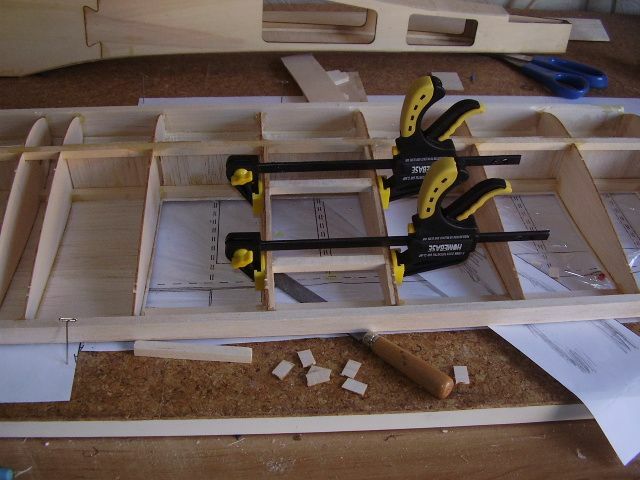 This will allow me to use dowels in the leading edge and nylon screws in the trailing edge to hold the wing on. 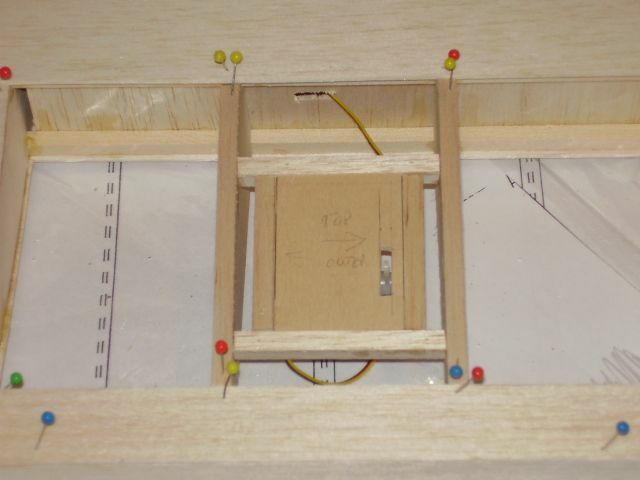 The ply rectangle is going to be the dowel locating plate. I've also extended the fuel tank shelf to make a battery tray for a 2200 3s and drilled the firewall for the motor mount and installed the captive nuts. 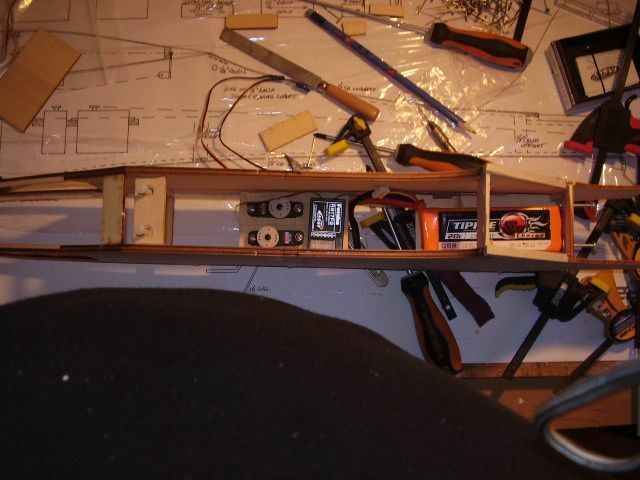 The picture shows the dowel locating plate in approximate position, above the fuselage side is the extended fuel tank shelf which will become the battery shelf. Top right is the firewall with captive nuts and a slot cut to aid cooling and provide a route for the wires from the motor to the ESC. I have also built the servo shelf with cut outs for the servos, hardwood rails fitted and space to the Rx - so that's ready to go in. 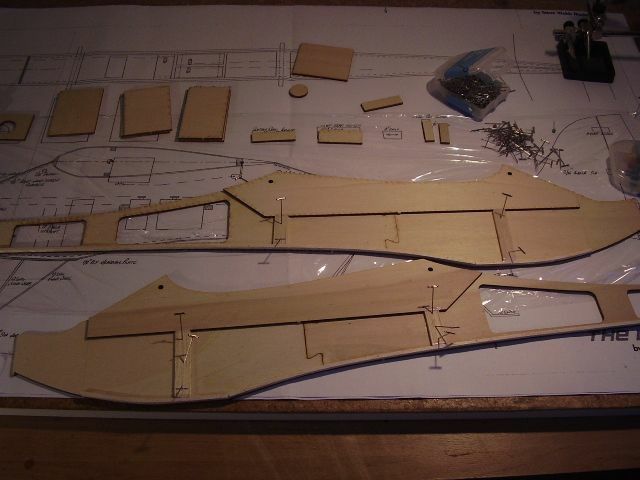 With a bit of luck I'll have the fuselage together tomorrow. I have some full size hours in one from some years ago. Me too Chris, time in the Chipmunk, and Sedburgh Gliders and 3 solos in the T21. Thinking about it was the T21 the Sedburgh (Side by side) and the solos done in the Kirby Cadet? Just loved the power flying 1969 at RAF Newton, but I also did the gliding course at RAF Spitalgate, the Slingsby we nicknamed the Brick and the Sedbourgh a barge. Still do a bit at Husbands Bosworth. Just love the Tug. Sorry BEB, just couldn't resist. No problem Chris - interesting stuff. 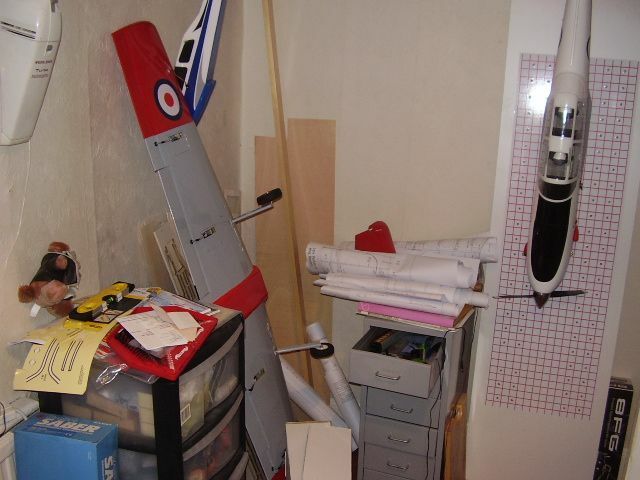 I suppose many of us went down the same route - its hardly surprising we ended up making model planes is it! Too True BEB, these days it's dual only I'm afraid, since my heart attack. We're making progress - albeit rather slooooooowwww! Too much flying in the nice weather and not enough building! As you can see we have an extra couple of formers! 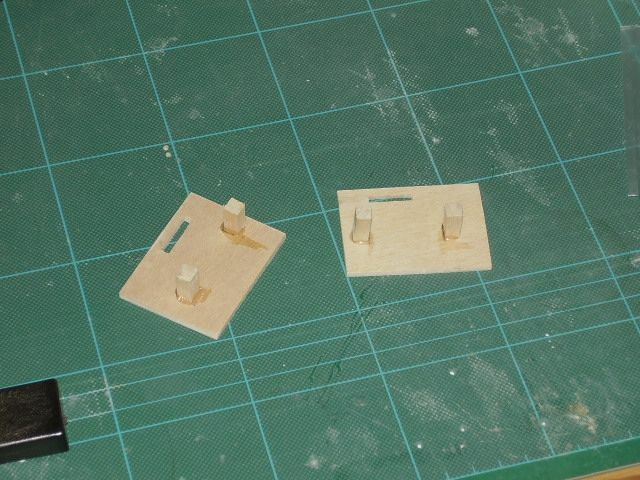 One in front of the wing to hold the wing dowels and one at the rear of the wing - just under where the trailing edge of the wing will fall - with two 4M captive nuts fitted to receive the nylon wing bolts. One slight issue with this is that I hadn't fully appreciated just how narrow the WebBit's fuselage is, the dowel and bolt holes are only 1" between centres - that doesn't offer a lot of resistance to twisting. I'll just have to hope its enough! I will probably reinforce the dowel holes with some tubing, that should help. The rx is not fixed in yet - hence why it looks a bit wonky! I was just trying stuff "for size" really. The ESC will go under the battery plate and there is a wide slot cut in the lower firewall to run the ESC/Motor wires through and to direct some cooling air at the ESC. 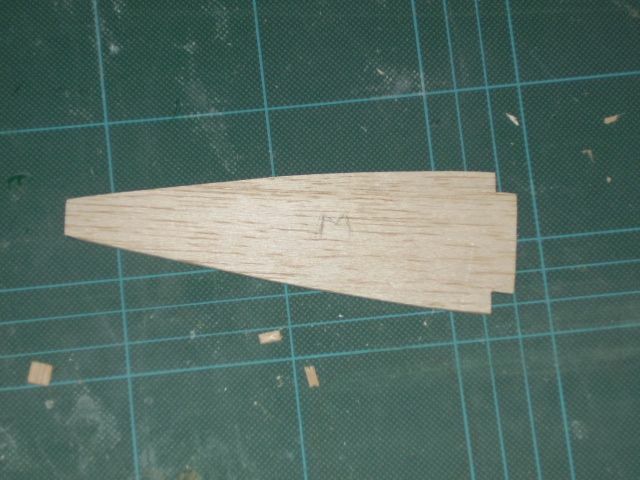 I'll sheet up the bottom and the rear upper fuselage next. 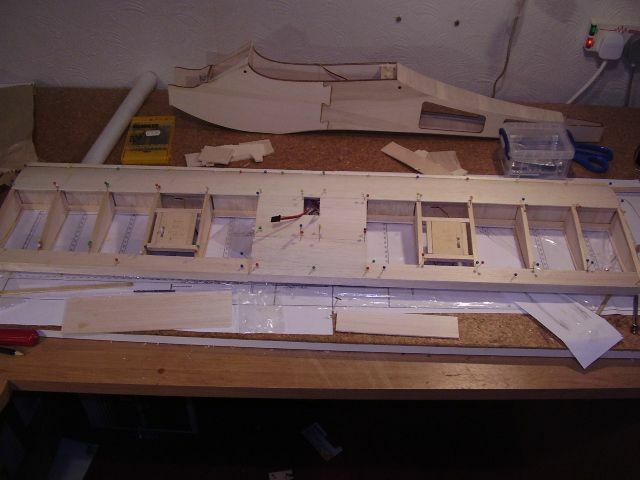 I won't put the "windscreen" former and sheeting in until I've built the wing as it will be easier to alingn the wing locating dowel holes without it there. It will also make velcro lining the battery tray a bit simplier! Coming along BEB. Like the wing bolt setup. Quick progress report. Managing to get a little bit done now and then. This afternoon was useful in that it got too windy at the field so I decided to come home and make a bit of progress here. 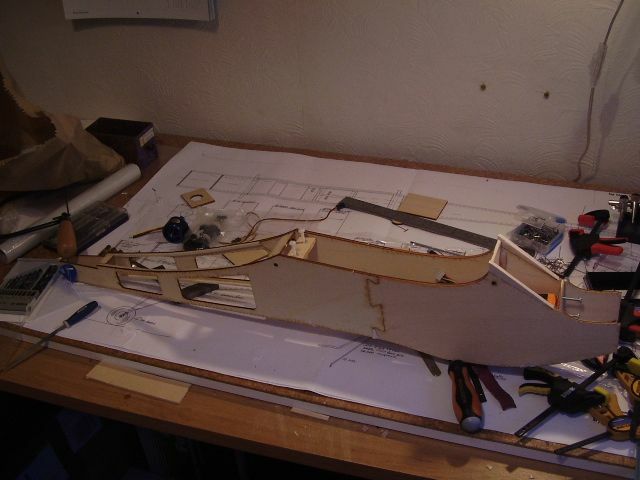 As you can see the rear part of the fuselage is now sheeted up and the wing is well underway. I've just got the capping strips to add on this side then I can turn it over and sheet the other side. 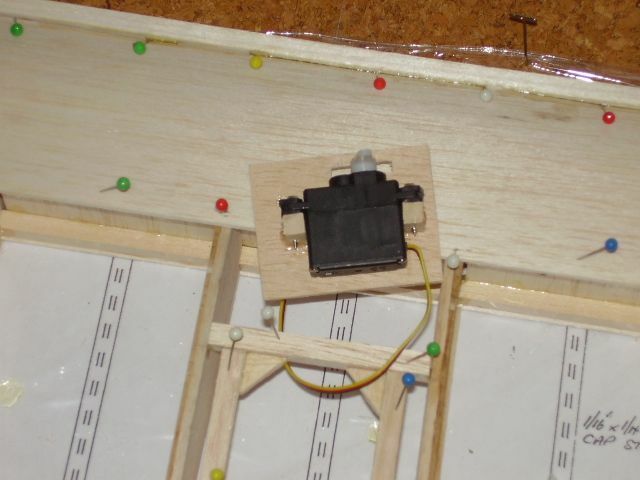 I then have to think about how I am going to fit the aileron servos. Sounds like yr just getting out flying and enjoying yourself far too much! Well the wind has grounded me, so progress on the WebBit improves . As I said at the begining I'm not doing a "blow by blow" blog as this has been done better elsewhere. I'm just going to deal with anything I do that is outside of the standard WebBit instructions. I've decided I want to fit separate aileron servos in each wing rather than use the original single servo working a pair of torque rods in the design. The problem is that the WebBit's wing ribs are very thin and I'm not too happy that they can support the servo and control surface forces unaided. OK, if I'd thought on I would have made a couple of substitute thicker ribs - but its a bit late for that now! 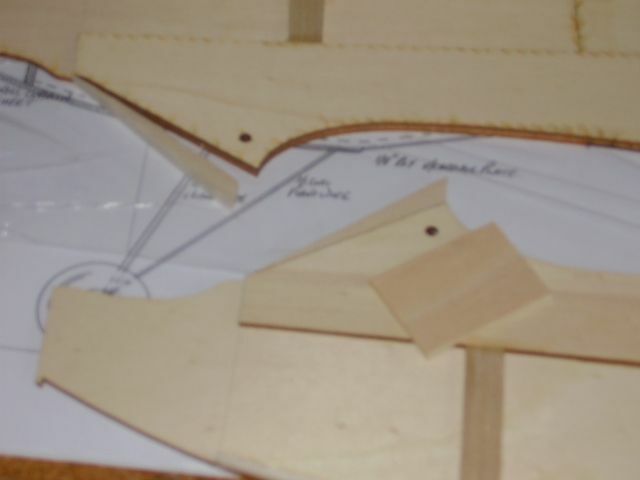 They glue to the rib and the back end butts up to the false trailing edge and the front slots between the upper and lower spars. So this will impart a lot of additional stiffness and strength for relatively little extra weight. 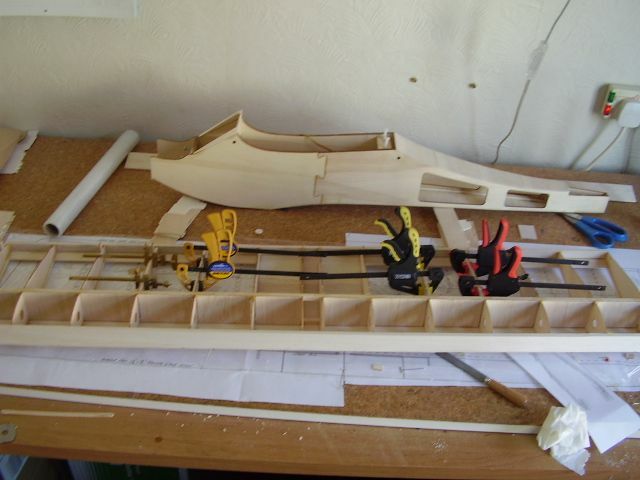 A small slot is placed in the inter-spar webbing at the back of this bay, this will pass the servo lead which will then run along the D-box to the wing centre. As you can see from the above I don't belong to the Chris Bott school of "build it light"! I could use Chris's cut out discs as extra strengthing pieces! 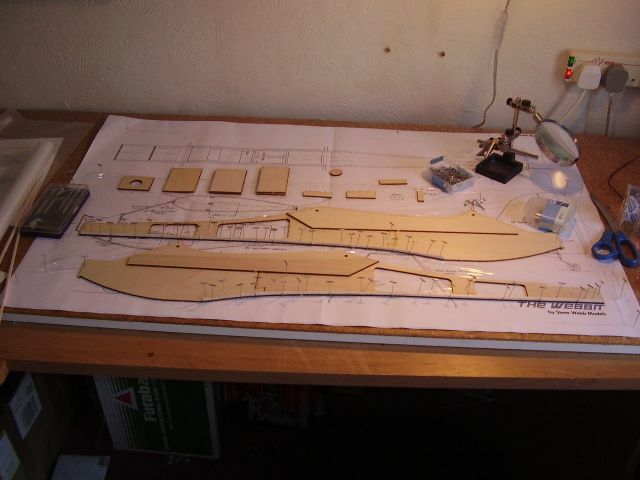 Well, just the trailing edge, ailerons and wing tips to do now and the wing is finished. Not much chance tomorrow - I have to be "a Dad" and take the family out! Looking good BEB. All that lack of build it light should mean you don't have to strengthen it afterwards like me. I so wish I could get out there and test mine again though. Delivering daughter 2 back to uni tomorrow and that will be my bank hol. I guess there's no rush to get yours covered, but then suddenly we might be met with some decent maiden weather?